A 126-year-old cookbook written by one of Siam’s most revered singers, Maawm Sohm Jeen (Raa Chaa Noopraphan) (หม่อมซ่มจีน, ราชานุประพันธุ์), has been rediscovered, offering a unique glimpse into the culinary repertoire of 19th-century Siam. 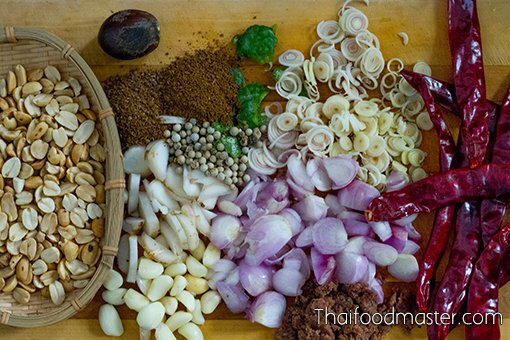 Maawm Sohm Jeen lays out the blueprints for many of Thailand’s timeless favorites, including phanaeng curry. 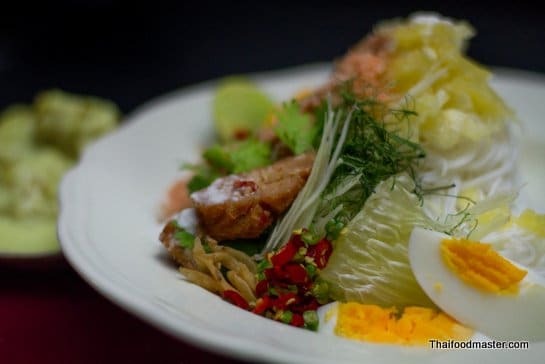 While not necessarily offering superior flavors, her recipes can serve as guidelines for Thai chefs seeking to elevate the dish within its correct context. 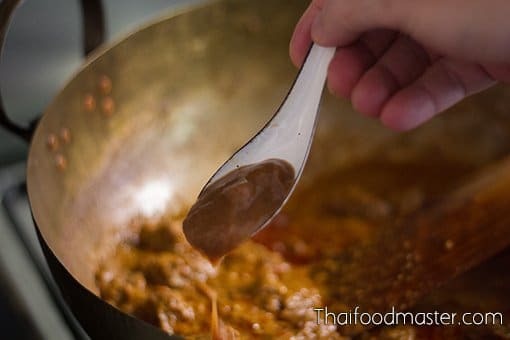 In this chapter – the first in a series where we unveil Maawm Sohm Jeen’s Thai culinary treasures – we examine the different forms of phanaeng curry from the 1800s to the present day, as we reconstruct the 19th-century version and craft step-by-step a traditional beef phanaeng curry. 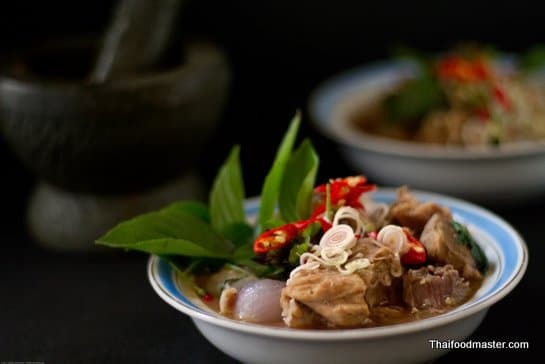 Cooking is an art, and perhaps this is why we were so excited to discover that the first-ever cookbook to be written in Thai – and one that preceded Lady Plean Passakornrawong’s (c. 1908 AD) epic cookbook “Maae Khruaa Huaa Bpaa” (แม่ครัวหัวป่าก์, ท่านผู้หญิงเปลี่ยน ภาสกรวงษ์) by 18 years – was written by an illustrious Thai diva and music teacher of that era. Maawm Sohm Jeen was born sometime between 1857 and 1862. She became a renowned musician and the first Siamese artist to record a Gramophone disk; and she was married to Phrayaracha Noopraphan (Nai Soot Jai Bunnag) (พระยาราชานุประพันธ์ – นายสุดใจ บุนนาค), a handsome officer in the foreign ministry of King Rama V.
In 1890 (2433 BE, 109RE), Maawm Sohm Jeen composed a cookbook under the title “Tam Raa Gap Khao” (ตำรากับเข้า), which was published by the Wacharin printing company (โรงพิมพ์วัชรินทร์). This somewhat obscure document, known only to very few people, was printed around the same time that Lady Plean’s recipes began appearing in the city magazine Bpradtithin Bat Laae Joht Maai Haeht, between 1889 and 1890 (ประติทินบัตร แล จดหมายเหตุ). Both Lady Plean and Maawm Sohm Jeen were of the same era and class, and both had married into the same aristocratic lineage, the Bunnag family. As such, their recipes reflect the high society kitchen of that time as well as their personal preferences. A careful reading through the book will reveal slight differences between the two authors. Lady Plean’s recipes are somewhat more elaborate and refined; she classified her recipes according to the cooking techniques used. Maawm Sohm Jeen’s recipes, on the other hand, are unsorted, and she makes greater use of jungle meats such as wild boar, iguana and other lizards, soft-shelled turtle, frog and teal duck. 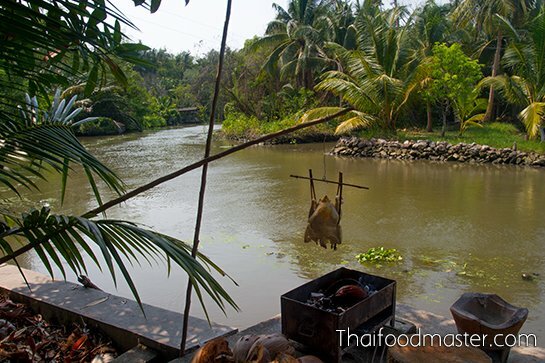 The staple Siamese diet of rice and fish did not change very much for ordinary people over the centuries, so it should not come as a surprise that dishes with culinary codes linked to the mysterious trade routes between Ayutthaya and the Islamic world in the 14th to 17th centuries would have a special appeal to the aristocracy. In Thai, Khaaek refers mainly to the people and cultures of the Islamic world, principally Persia and India, and also to the regions of the Middle East, Indonesia and Malaysia. 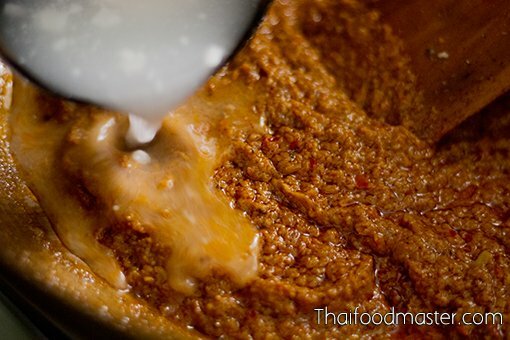 Phanaeng curry is one of those Khaaek-derived dishes: it is a thick, gravy-like coconut-based curry thickened with peanuts and seasoned with the sought-after dry spices of that era. 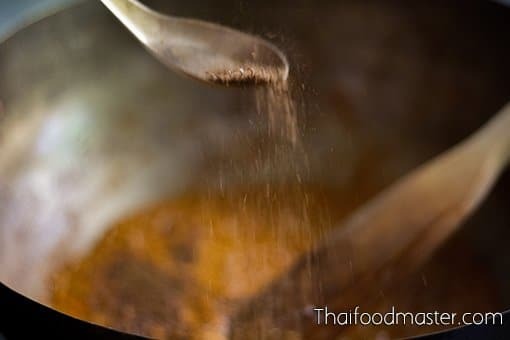 The use of these expensive spices in phanaeng curry, along with beef, which was an uncommon meat at the time, appealed to the royal court and high society but was out of reach for most ordinary people. However, the dish gradually made its way over the palace fences and during the reign of King Rama V, phanaeng was popular within the Royal palace and among commoners alike, eventually securing its present status as one of the Thai dishes most loved by foreigners. 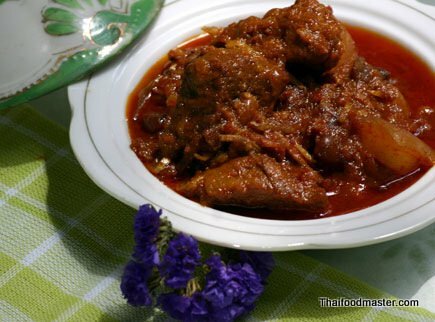 But the modern version of phanaeng curry has been dramatically modified from the original: today the curry is not as thick, and eggplants are sometimes added. Thai culinary authority M.L. 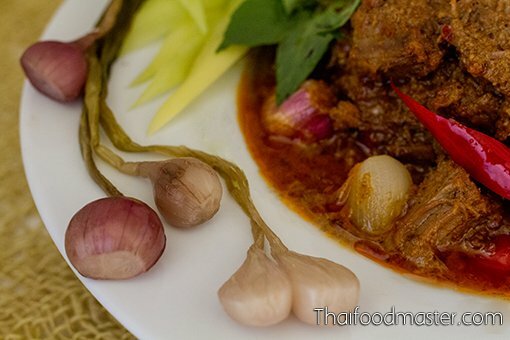 Neuuang Ninrat (1913-2010) (หม่อมหลวงเนื่อง นิลรัตน์) describes how to prepare phanaeng curry according to the method used in Suan Sunandha Palace. 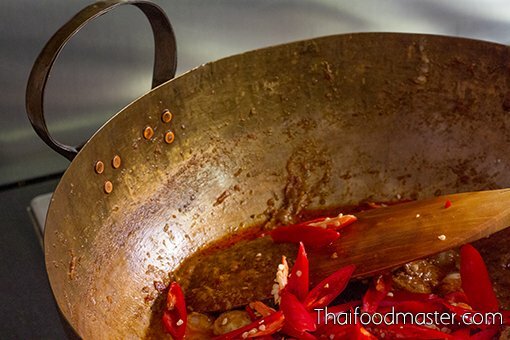 This is the common recipe that appears in most Thai cookbooks published in the last forty or fifty years. According to M.L. 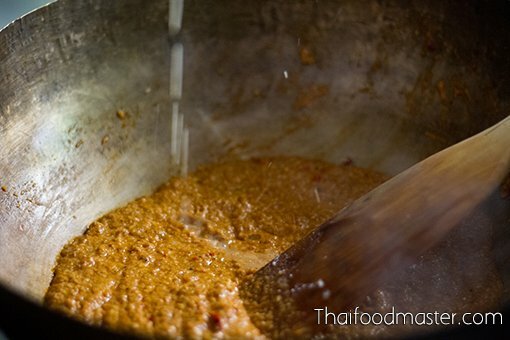 Ninrat, only meat, curry paste, coconut cream, sugar and fish sauce are used. She specifically states that no vegetables whatsoever are added. For the curry paste M.L. Ninrat uses dry chilies, roasted coriander seeds, roasted cumin seeds and white peppercorns, along with lemongrass, galangal, coriander root, kaffir lime zest, shallots, garlic, fermented shrimp paste (kapi) and salt, to which roasted peanuts are also added. 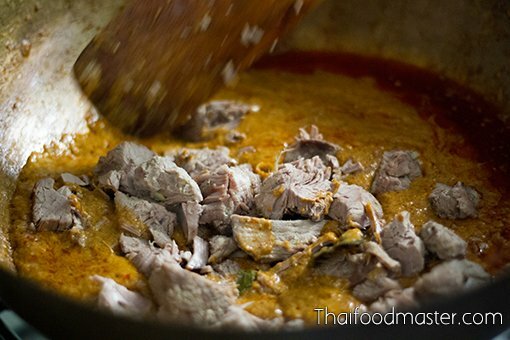 The meat is cooked separately in coconut milk until it is soft and tender. 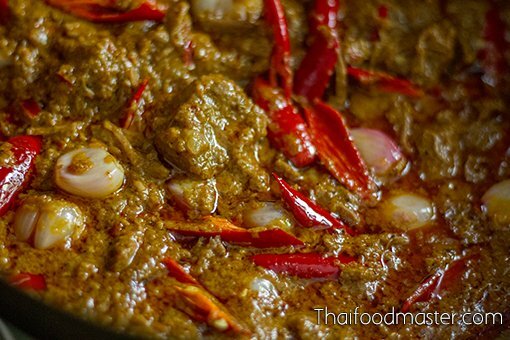 The curry paste is then fried in coconut cream, to which she adds the precooked meat. Once the curry and the meat flavors have merged, M.L. Ninrat seasons the curry with fish sauce and palm sugar: the curry is then ready to be served alongside pickled shallots, fresh banana chilies and sweet basil leaves. 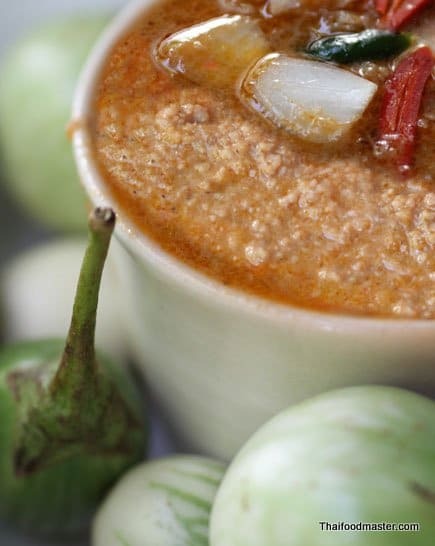 The earliest known evidence of phanaeng appears in Maawm Sohm Jeen’s (raa chaa noopraphan) (หม่อมซ่มจีน, ราชานุประพันธุ์) book “Tam Raa Gap Khao” (ตำรากับเข้า), published in 1890. 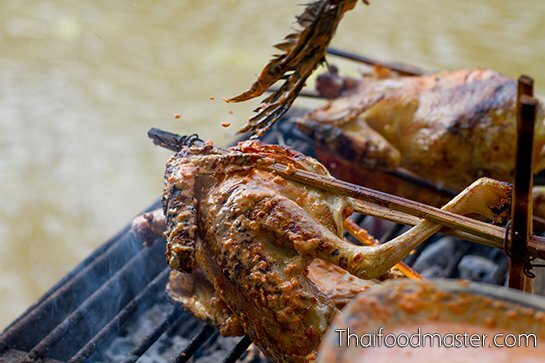 Maawm Sohm Jeen describes a method of grilling a whole chicken while brushing it with a curry paste and coconut cream; called gai phanaeng (ไก่ผะแนง), it is quite different from what we know today or what was described by M.L. Neuuang Ninrat. A curry paste is made from roasted dry chilies, roasted coriander seeds and roasted cumin seeds, white peppercorns, lemongrass, shallots and coriander roots. 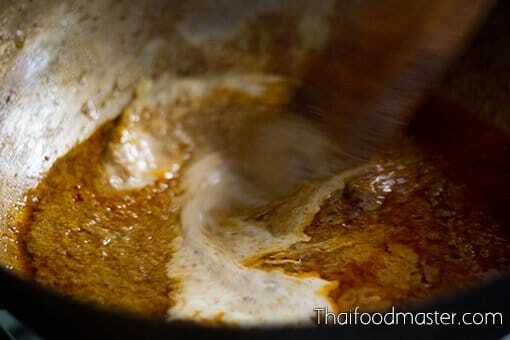 The curry ingredients are pounded together into a smooth paste, and the paste is then mixed with coconut cream. 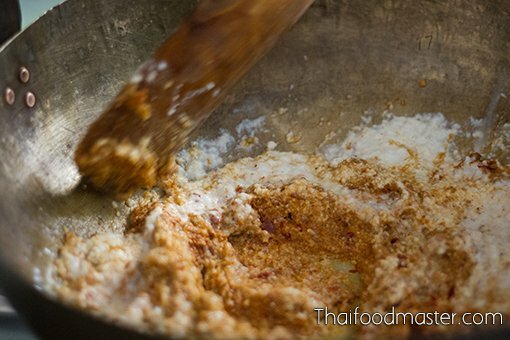 Mixing the curry paste with coconut cream. 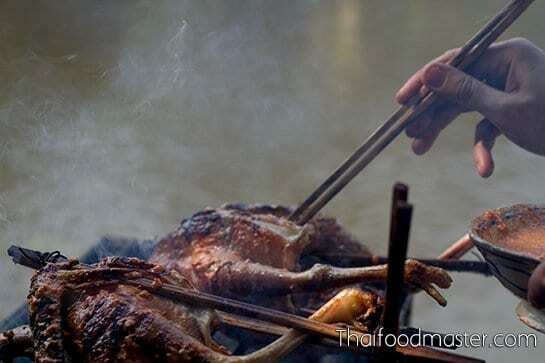 The chicken is cleaned and spread open, held by bamboo sticks and placed at arm’s height over charcoal at low heat. 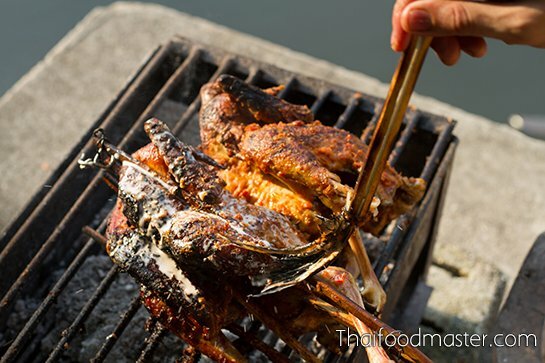 It is slowly grilled and lowered closer to the charcoal as the meat begins to dry. Hang the chicken over the charcoals at arm’s length height. 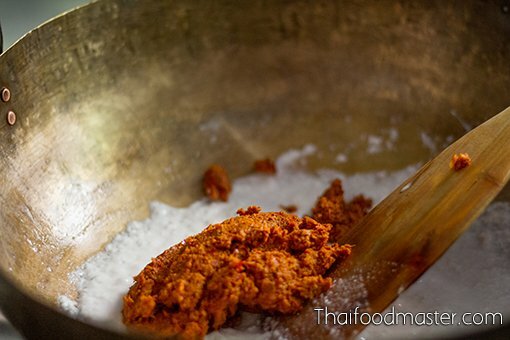 When no more juices drip from the chicken, the meat is brushed repeatedly with the coconut cream-curry paste mix (using chicken feathers as the brush) until all the paste is used, and the chicken is nicely glazed. A final brush with coconut cream is the last step before the dish is ready to eat. 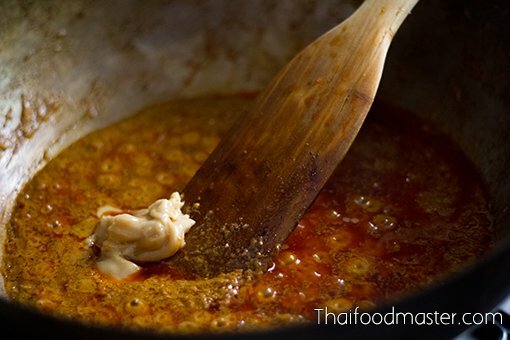 Brush the curry paste and coconut cream mixture repeatedly over the chicken, letting it dry before applying a new layer. 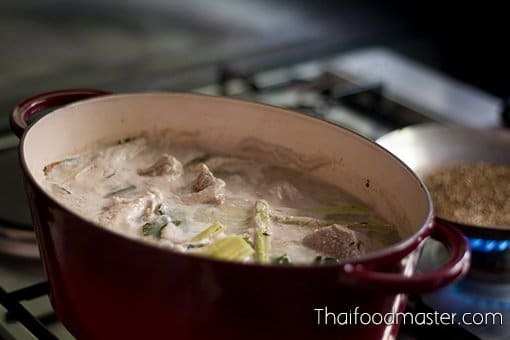 When the coconut cream curry paste mixture is finished, and the chicken is nice and dry, apply a final layer of coconut cream to introduce moisture and extra sweetness. Maawm Sohm Jeen describes a totally different character of gai phanaeng. 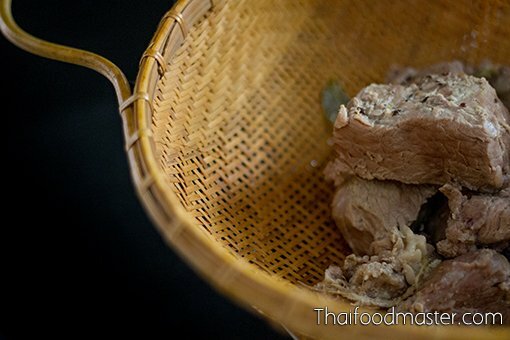 Similar to southern grilled curry chicken (gai gaaw lae, ไก่กอและ), Maawm Sohm Jeen’s curry base contains fewer ingredients. She does not use peanuts, nor does she add garlic, kaffir lime and kapi but even more intriguing is that she does not season the dish in any way – not even salt is added. The taste of the dish rests entirely on the natural flavors of the chicken and the sweetness of the coconut cream and shallots. Of course, this is based on an assumption that the omission of salt and seasoning was deliberate and not left out due to human error. 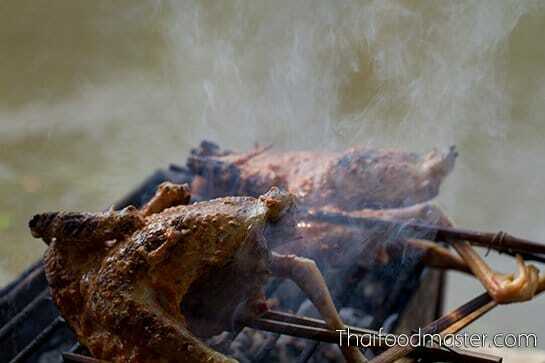 We have seen so far that phanaeng appears as a curry or as grilled chicken, but phanaeng comes in yet another form. As presented in 1971 by cooking master M.L. Terb Choomsai (1913-1986) (หม่อมหลวงเติบ ชุมสาย) on her television show and a book that followed, there is a baked version of phanaeng. M.L. 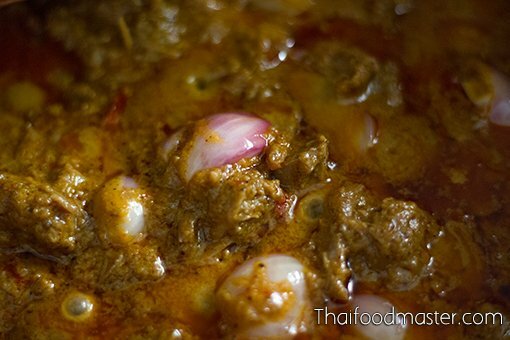 Terb calls this dish khaao phanaeng ohp (ข้าวพะแนงอบ). In it, she mixes phanaeng curry with cooked jasmine rice, bakes it until it is fragrant, and serves it accompanied with pickled vegetables. 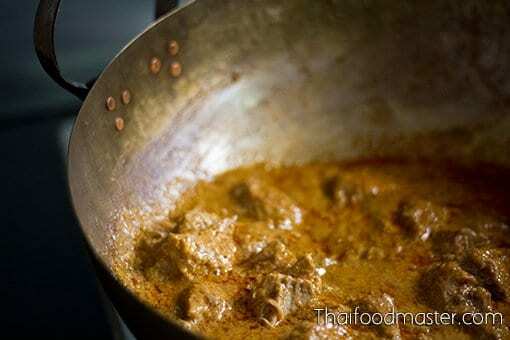 This beef curry recipe is adapted from the recipe of M.L. Terb Choomsai. 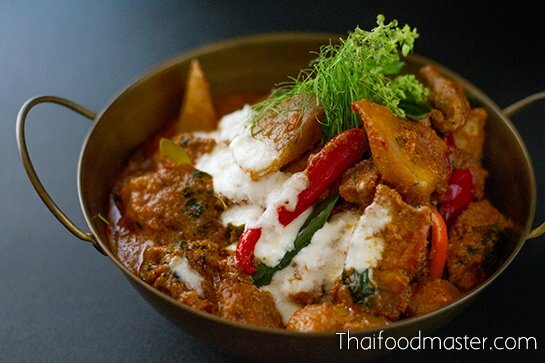 The curry is rich and thick, salty and sweet, with a nutty peanut flavor. 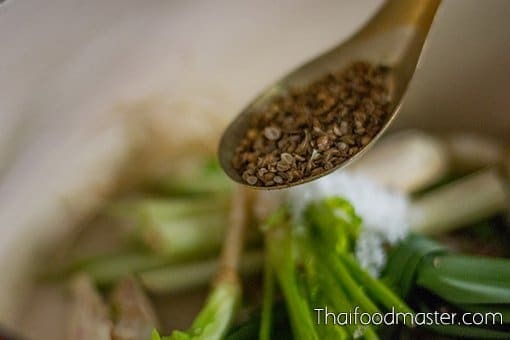 It is also fragrant; making use of dry spices at different stages of the cooking process and gradually building layers of flavors and aromas as the meat is cooked. It is served with pickled shallots, fresh banana chilies and sweet basil, which aptly support the richness of the curry by cutting it through with tartness, piquant notes of freshness and hints of anise from the sweet basil. 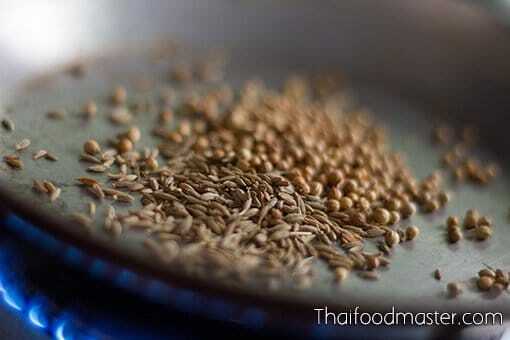 Roast coriander seeds and cumin seed over low heat until fragrant. Prepare all the ingredient for the curry paste. 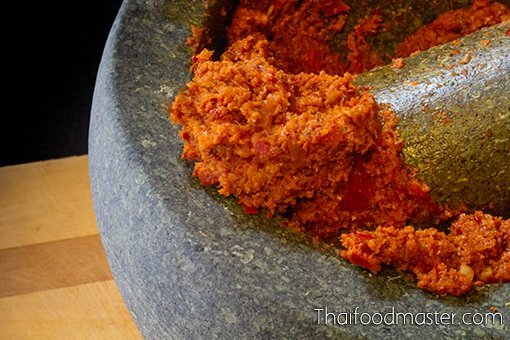 Using a pestle and mortar, pound the curry paste until it is smooth. 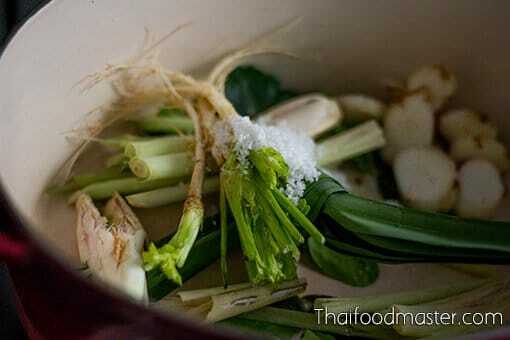 Put pandan leaves, kaffir lime leaves, lemongrass, galangal, coriander roots and salt into a large pot. Add roasted coriander and cumin seeds. 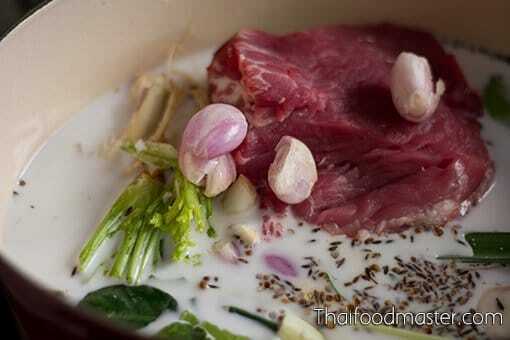 Add the meat, cut into large chunks, along with the shallots and cover with coconut milk. Cover the pot and simmer over medium heat. Strain the meat, discard the herbs, and set aside the cooking broth. 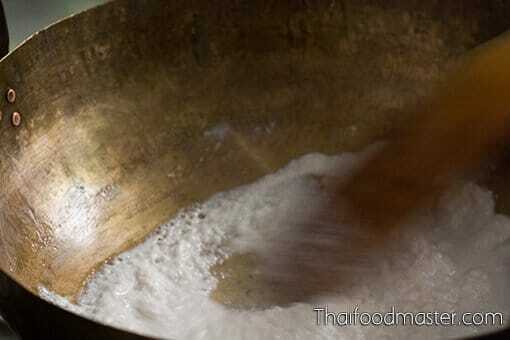 In a large wok, heat coconut cream over medium heat, stirring constantly until the oil is rendered out. 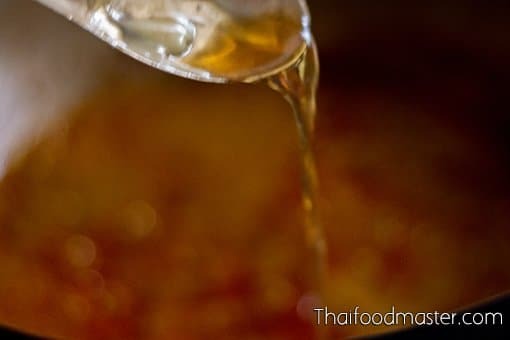 Add the meat cooling broth gradually in small batches, stirring constantly. Add ground roasted nutmeg, coriander seeds and cumin seeds. 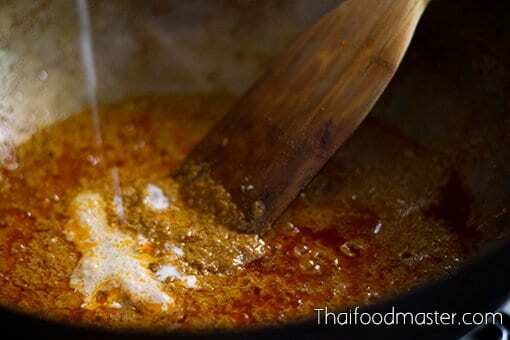 Continue frying the paste until red oil appears, and the curry mix is thick and aromatic. 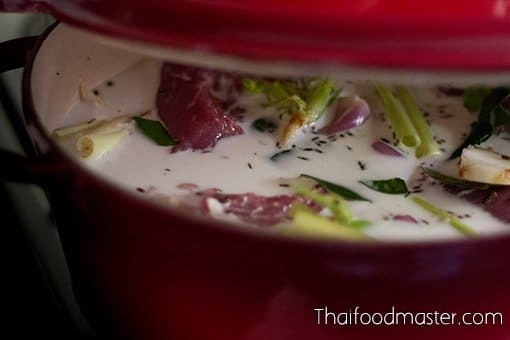 Gradually add coconut milk in small amounts. Keep stirring until a beautiful red oil floats on top. Add coconut cream as needed. Add some coconut cream to smooth up the texture. Add back the cooked meat. 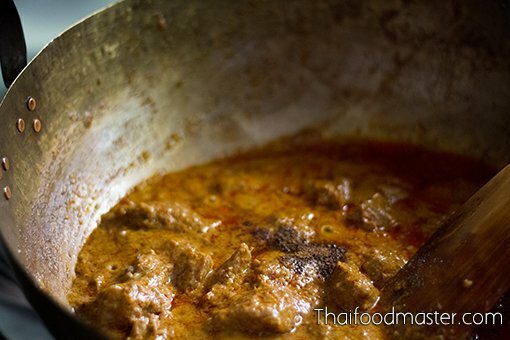 Cook the meat in the curry for few minutes, until the flavors have merged. Add more dry spices (coriander seeds and cumin seeds) for an extra layer of flavor. Cook the curry until the shallots are cooked. Add fresh red chili peppers. Cook for one extra minute. Serve with pickled shallots, fresh banana chilies and sweet Thai basil. This is amazing post, information, photos and recipes. Thank you Thai Food Master! 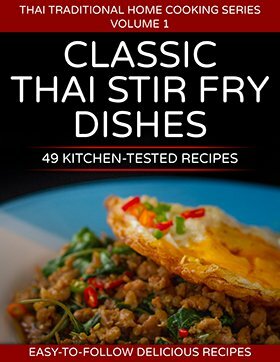 You are great what a find with your looking into the past and cooking Thai food as it should be. Your presentation, skill with words, and photos makes me smile and then feel humble, keep it up. I am getting my cooking trip set up for 2017, can I make my way to your kitchen again? Need advice on some ingredients not available here (in Israel). Hello Doron, Pandan leaves for this recipe can be used in a dry form, or you can substitute it to lemongrass. We use it just to mellow down the meat odor. I have no idea what to replace kafir lime zest with… i never tried but some internet sources recommend using fresh lime zest and minced kaffir lime leaves instead. I have never tried it myself. 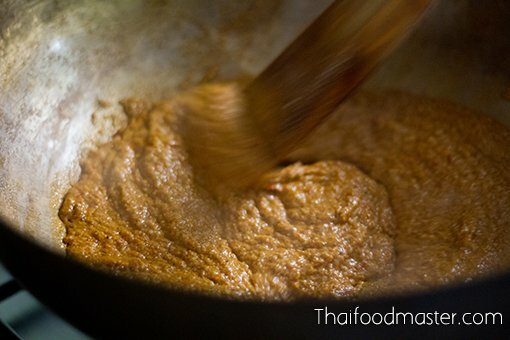 Fantastically detailed information on Phanaeng Curry. Beautiful photos. Can I ask you something? Do you know the origin/meaning of the word ‘phanaeng’? Thank you Susan. 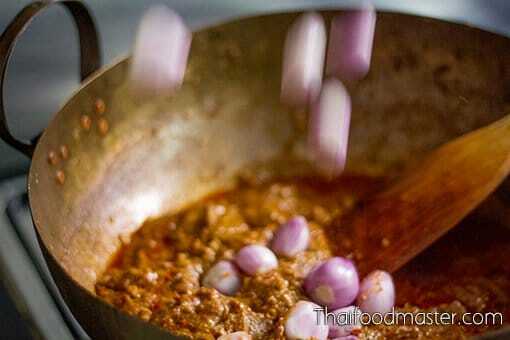 There are absoultly to clues to the name origin, the notion the dish originated or called after Phenang state in Malaysia has no historical evidence.